Hear Her Sports is the podcast where female athletes share secrets to speak up, live with power and confidence, & do amazing things in today’s changing world. I'd love to hear from you. Write me at elizabeth@hearhersports.com. Elizabeth Emery is a big fan of sports and female athletes. She leaves every interview smiling, super excited, energized, motivated, and inspired. She loves introducing exceptional female athletes to a bigger audience and sharing their stories and words of wisdom. Elizabeth is a former professional athlete who has been interested and involved in sports since before the passage of Title IX. In the '90s, she raced bicycles professionally, traveling all over the country and the world. She was a member of the 2000 Olympic Long Team, a National Champion in the Time Trial, a gold medalist in the Pan American Games and the Pan American Championships. She raced in The Tour de France for many years when it was called The Grand Boucle and in multiple World Championships for Team USA. 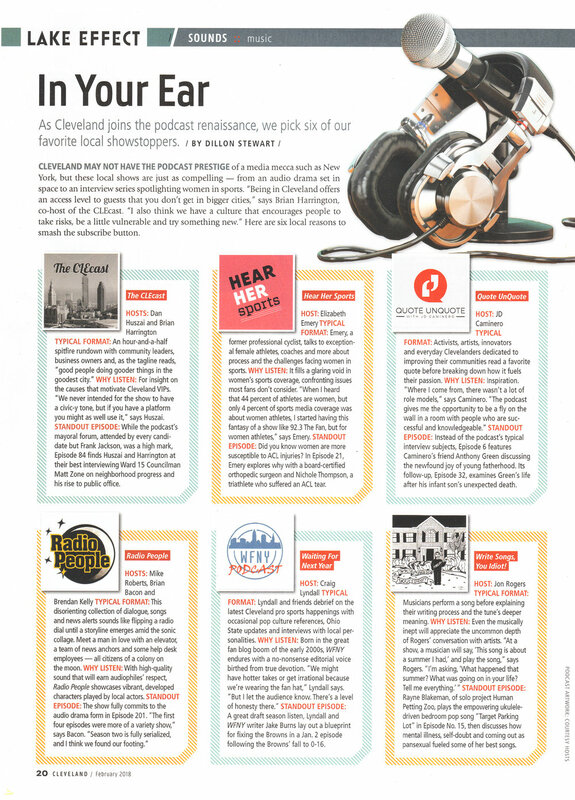 Hear Her Sports is featured in Cleveland Magazine as a favorite podcast! The podcast started because I enjoy keeping up on sports and competing athletes. And yet it’s difficult to find anything written about women. I’d look for a while, then give up. When I moved to Cleveland in 2008 I started following the Cavs. Each year during the finals, when I'd spend many hours watching games, I would kick myself for not spending equal time watching women’s sports. I started debating with friends about reasons for lack of coverage. To be prepared and informed for these discussions I researched. 44% of athletes are women and only 4% of the media coverage is about women. Listening to the endless stream of manly discussion, call-ins, and chit-chat on the The Fan 92.3 during the Cav's season made it easy to learn about players, teams' strengths and weaknesses, and stats. I wanted that same wealth of information for women's sports. I wondered what kind of sports coverage would keep me interested. What would I like to read and listen to? Someone should really provide that engaging and smart content about women's sports. Finally, I began to imagine how I could be that someone. · Join me in hearing what exceptional female athletes have to say. · Tell your friends, colleagues, and sporting partners. Hear Her Sports values women and girls involved in sports and all female athletes by giving them voice. We value other organizations that support equality in sport. Sports isn't just sports. Equality in sports is equality in possibilities for everyone's future. Read from the newsletter archives. To make a contribution of any size, donate here.